First of all, I would like to thank Tim Hortons for putting me through college and employing me from the ages of 14-19. For all you math-challenged people out there, that is 5 whole years I spent in those beautiful brown poly pants with a visor and hairnet on my head. During my time at Tim’s, I moved from a storefront position to a baker, and back and forth as the managers saw fit. 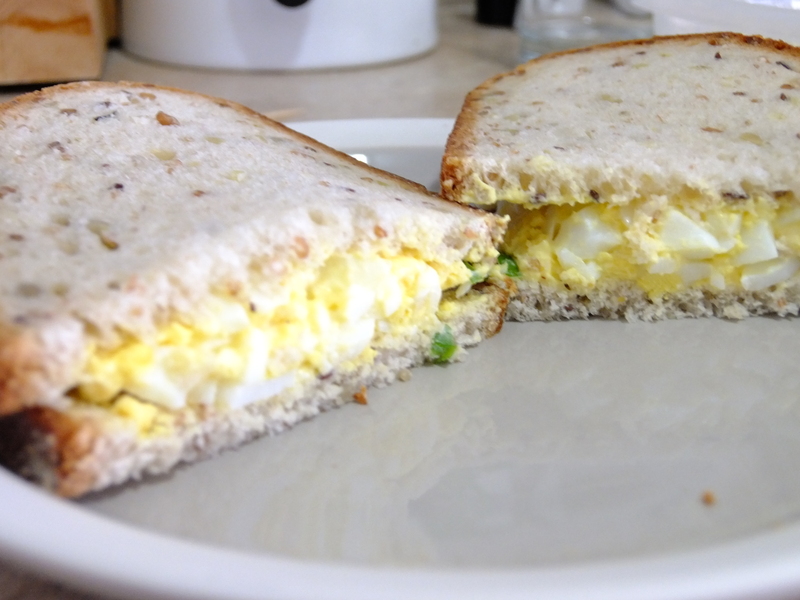 Part of the baker’s responsibility was to make the egg salad and chicken salad for the sandwich bar. I never actually ate egg salad (or chicken salad for that matter) until my cousin’s bridal shower a couple years ago, which was when I instantly fell in love. I have never made this off a recipe since my days at Tim’s, because like everything in life, if you do it over and over enough times, it will become second nature (whether you like it or not). The funny thing about this story is that the eggs come pre-boiled and peeled at the store, so the one thing I have had to master all by myself is how to properly cook a boiled egg. I now have this down to a science and I recommend you check out my post on how to boil a perfect egg before you start. You will need hard boiled eggs (approx. 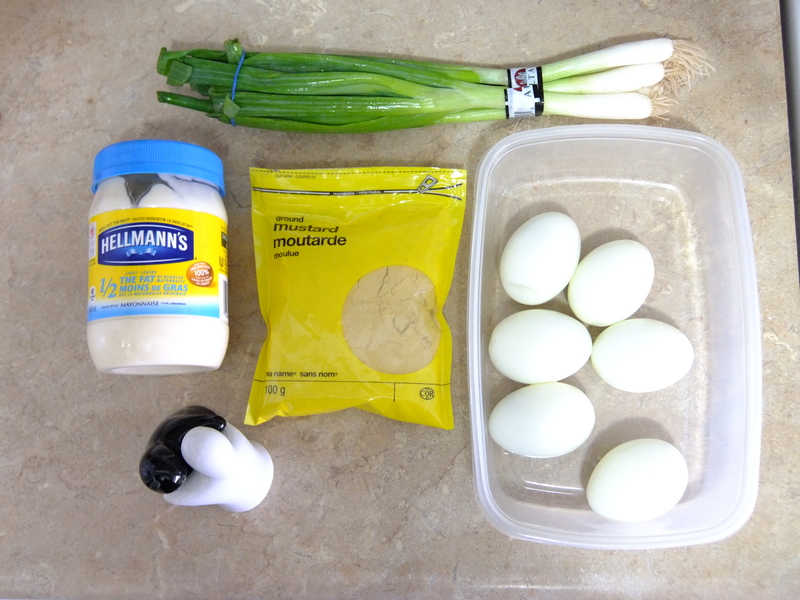 2 per sandwich), ground mustard, salt, pepper, mayo (we chose low fat), and green onions (to taste). I have a specific egg salad tupperware container that I always use (another habit courtesy of Tim’s). I use our butchers knife to chop up the eggs in this container because it fits perfectly and is super fast. Since this tupperware is used only for egg salad, I don’t worry about getting the cut marks on the bottom. 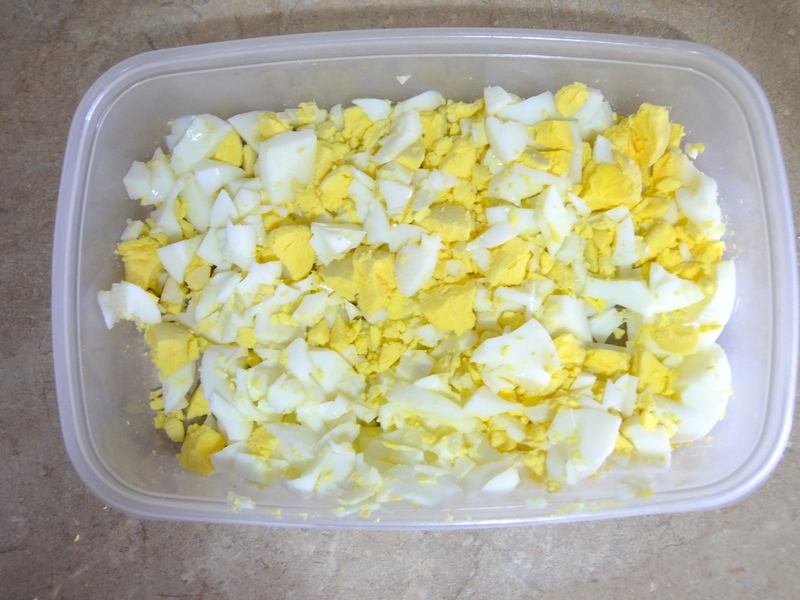 You could also use a cutting board, but having the sides on the container makes it easy to cut up the slippery eggs without them flopping around all over your kitchen. Once the eggs are all chopped up (this takes me about 30 seconds with the container method), you can add the remaining ingredients to taste. I usually add in a small amount of mayo and start mixing it up with a spoon before adding more later if needed. It’s easier to add more than to take some away! 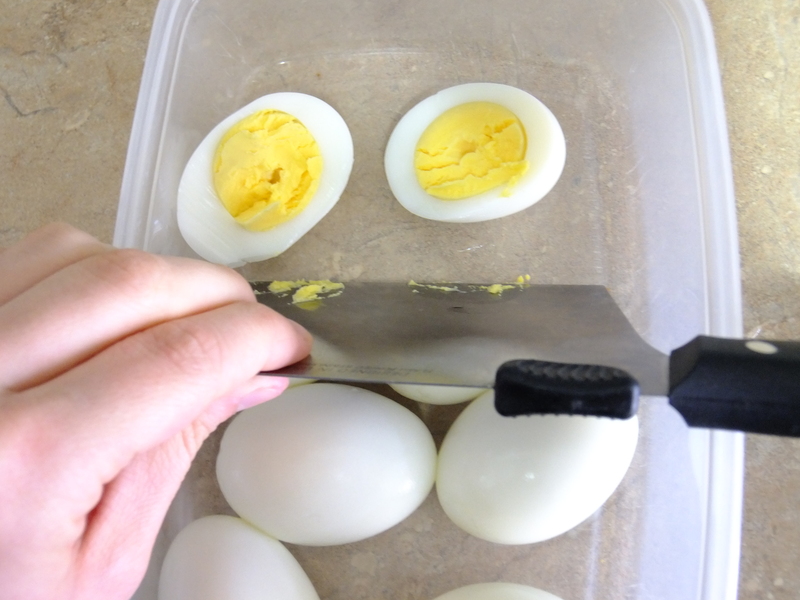 Chop eggs with knife in a tupperware container. Add remaining ingredients, mix with a spoon, and serve on bread. Refrigerate leftovers.